Harvard symbologist Robert Langdon and Paris policewoman Sophie Neveu overcame one obstacle after the other in a never- ending series of lucky breaks that depended on walkie-talkies that could not work, Swiss banks whose passwords were written by Sudoku gamers, a friendly rich guy with a jet, and Langdon’s bottomless memory of secret texts and symbols that would have shamed Google engines. That they would crack the mystery to find the Holy Grail was a difficult yarn to swallow. Why? 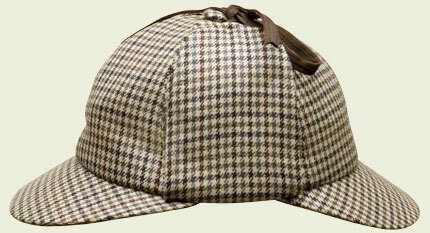 In A Scandal in Bohemia, Holmes is having one on Watson and, more importantly, on us. It works. But, why does Doyle’s series of coincidences work and Dan Brown’s does not? They both involved genius insights that lead to the hither-to unsolvable conclusions. Is there a difference? First, Doyle makes the reader ‘everyman.’ He has written Watson in the first person so that we, as readers, see Holmes’s powers of deduction just like we were in Watson’s shoes. Brown’s point of view, however, was fly on the wall and thereby made Langdon and Neveu remote, people being spoken about, not people with whom we were speaking. In writing from that point of view, it is essential to write patiently, with intimate details of things from everyone’s daily experience, so that the reader can visualize as if he involved. Second, Doyle’s books are almost not even about the mysteries – they are about Holmes. They are character-driven books whose personalities are the same each time — a befuddled doctor, a bumbling Scotland Yard inspector, and a brilliant but idiosyncratic deducer of obscure facts from every-day events. Brown’s book is story-driven, a travelogue chase to find the Grail before the bad guys stop the heroes. The former is about a character, the latter about an event. Finally, as suggested in the last installment, Brown’s use of coincidence relies on things that are beyond ordinary human experience. Who has a rich friend with a jet who is willing to help you flee the country in the middle of the night? Who solves a murder by decoding, or even stumbling across, a mythical religious symbol that has been hidden by secret societies for thousands of years? By way of contrast, Doyle never uses coincidence – he employs the very things that we all have, such as dirty boots, barking dogs, ink on our thumbs (failing eyesight from word processor monitors…). Nor do they have much to do with the mystery. Instead, they are written to foreshadow the mental sleight of hand that Holmes will eventually use to solve the case, meanwhile hiding everything in plain sight and then explaining it after the fact. One technique is to write details that actually happen to people. Cut fingers. Wounded pride. Red lights. Missed assignments. Crashed computers. Once a reader accepts the truth of the story, the leap to the fiction of the story is much easier to make. Reading The Da Vinci Code is difficult, despite its detailed research, because it is difficult to believe that any of the things that happened to Langdon and Neveu could happen to him or her. With Sherlock Holmes, we quickly believe we could be Watson, if not Holmes himself. Good writing evokes in the reader an image of an experience that might be a memory, even if it is a memory of something that has never happened. It is like describing one of Monet’s haystacks, to a blind person.